Hundreds of jobs at the post provider could be cut under the plan. UP TO 300 An Post workers could be made redundant as part of a voluntary severance scheme that’s being rolled out next month. The State-owned postal service provider said managers and staff at its corporate and support services centre have been invited to submit applications for voluntary severance packages. Some 1,200 individuals are eligible for the scheme. “Since this is the first significant HQ voluntary severance programme for many years it is estimated that 200-300 staff may leave the organisation,” An Post said in a statement. The company added that the redundancy programme is being introduced “under recently agreed terms as recommended by the Labour Court”. At the time of publishing, the court had not yet published its recommendation on the matter. As well as culling hundreds of staff from its workforce, An Post is considering moving its current headquarters from Dublin’s iconic GPO building. The offices were last refurbished in 1984 when An Post was created out of the old Posts & Telegraphs company. Commenting on today’s announcement, CEO David McRedmond said the voluntary redundancy programme is part of a plan to “modernise every aspect of the business as An Post transitions from the old mails world to the new world of e-commerce and digital services”. “We have made great strides in the frontline delivery service, relaunched our parcels business and reached agreement on the transformation of the post office network,” he said. On An Post’s decision to review its current headquarters, McRedmond said the company is “determined to provide office accommodation fit for the business and its employees”. He said the estimated costs associated with refurbishing the building are “extremely high, requiring a budget of tens of millions of euros and will take a long time to complete, especially as much of the building is listed”. Although it may relocate its headquarters, An Post said it will “always maintain its main post office in the iconic building, regardless of any decision on the location of the company’s HQ”. An Post – which has closed dozens of post offices since 2007 and recently put hundreds more on the chopping block – reported an operating profit of €8 million in 2017 compared to a loss of €12.4 million the year before. The company controversially hiked the price of a stamp from 72c to €1, an increase that accounted for €60 million of its €840 million turnover in 2017. Last year, average headcount at the organisation was reduced by over 330 people. The average number of full-time staff at the firm was 10,315. A 2016 review of the business, spearheaded by businessman and founder of Insomnia coffee Bobby Kerr, highlighted the need for An Post to rejig its existing model and introduce new services in order to secure the future of post offices. 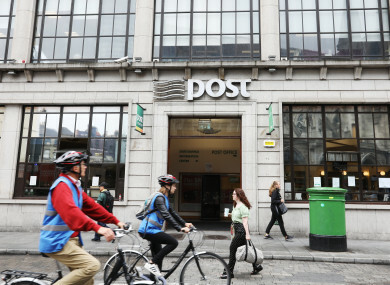 Email “An Post wants to move out of its 'dilapidated' GPO offices as part of a major shake-up”. Feedback on “An Post wants to move out of its 'dilapidated' GPO offices as part of a major shake-up”.